TurboTax said late Friday that it was again processing state tax refunds after a pause to probe increasing reports of fraud. The popular TurboTax software restarted the e-filing of state tax returns on Friday after temporarily stopping them because of reports of fraud. The company was concerned that criminals were using taxpayer's identity information (like a Social Security number) stolen from somewhere else to file fake returns via TurboTax and collect refunds. In Minnesota and Utah, for example, some taxpayers had logged into TurboTax and saw that a return had already been filed under their name. Intuit (INTU), the company that owns TurboTax, said it had a security firm do a preliminary examination and "now believes these instances of fraud did not result from a security breach of its systems." The company began processing tax returns again at 6 pm ET after a temporary shutdown that started Thursday. Federal returns, which have more stringent fraud controls in place, were unaffected by the outage. The investigation is ongoing, Intuit said. And in the meantime it has beefed up its security technology to protect customers against ID theft. 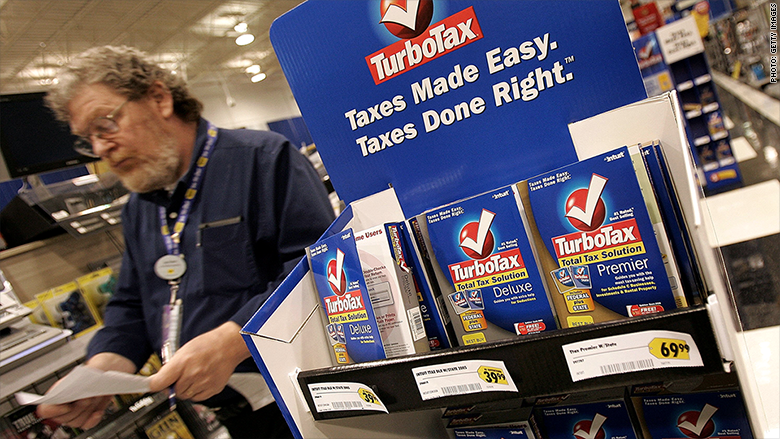 About 29 million people used TurboTax to file their tax returns last year. Earlier Friday, Intuit spokeswoman Julie Miller said the company had heard from a "small handful of states" that saw an uptick in suspicious filings. Miller declined to name the states, but Minnesota, Alabama and Utah all reported issues. Nineteen states in total identified similar problems, according to the Utah Tax Commission. In Utah, 28 fraudulent returns were filed over the course of two days this week, the Tax Commission said. Another 8,000 were flagged as suspicious and are being investigated. "That is off the chart for us," said Charlie Roberts, a spokesman for the state's tax commission. Utah's fraud detection system indicates that whoever is filing the fraudulent claims probably has access to taxpayers' returns from previous years. The state said its own systems had not been compromised and could not say how a criminal could have gotten access to the previous year's filings. But it warned that Utah taxpayers who filed state income tax returns electronically prior to 2014 through third-party vendors are potentially affected. "Unfortunately, the bad guys have a lot of places to get information," Miller said. All it takes to file a fraudulent return under someone else's identity is a name and Social Security number. The online black market is full of this type of information. CNNMoney discovered last year that hackers stole more than 6.5 million Social Security numbers in 2014. But possibly 80 million more were stolen so far this year from insurance giant Anthem (ANTM), which was was hit by a massive data breach. Hackers stole a database of names, birthdays, medical IDs, Social Security numbers, street addresses, e-mail addresses and employment information. When someone claims your tax return fraudulently, it can take years for the IRS to complete its investigation and clear your name. H&R Block, another tax preparer, said Friday that it was not having similar problems with state returns. Intuit customers who believe they are victims of tax fraud can call 800-944-8596 for help. TurboTax said it will prepare taxes for affected customers for free, and provide identity protection services and free credit monitoring. --CNNMoney's Jose Pagliery and Jeanne Sahadi contributed reporting for this story.